..... Click the link for more information. has been accomplished in modern chemistry. Alchemy is a religious philosophical perspective that was popular during the medieval era. The exoteric quest of the alchemist was the transmutation of baser metals (those that were more common and hence of lesser value) into the more valued metals, gold and silver. Philosophically, this quest was seen as a symbol of personal transformation in which the individual self, with its base nature, was turned into the ideal moral and spiritual person. Alchemy was always the belief of a small number of people, and it lost even this small following as alchemists proved completely unable to manifest the object of their quest and as a contemporary understanding of subatomic structures emerged with the evolving of modern chemistry and physics. Alchemy remains a fascinating subject for academics. Philosophically, it was a significant carrier of the dissenting Esoteric tradition, the major perspective challenging orthodox Christianity in Western society through the several centuries of the Christian era. It represents an enlightenment approach to the spiritual life: a counterpoint to the salvation offered by Christianity. Such approaches provide various spiritual disciplines or exercises (meditation, controlled breathing, psychic development) that produce altered states of consciousness and lead to a new spiritual awareness and an enlightened state of being. While many alchemists possibly used their talk of chemical experiments to legitimize their own religious views (in a time when dissenting religiously could lead to torture and death), undoubtedly, some alchemists believed that they could build various contraptions, usually a furnace, in which a literal transformation of elements could occur. It is also the case that some alchemists, many probably con artists, talked wealthy people and rulers into financing their alchemical activity. Today, medieval alchemy is dismissed as pseudoscience, although the study of alchemical philosophy flourishes. In that context, interest has shifted to modern claims of alchemical success. Through the nineteenth century, alchemy survived as a semi-secret fringe activity within the occult community, itself very much a fringe community at the time. 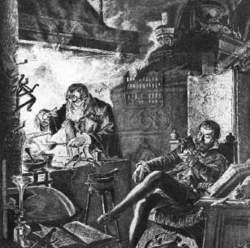 The most famous alchemist of the era, known only as Monsieur L., remained in the background, but he allowed the writer Louis Figuier (1819–1894) to speak for him. Through the twentieth century, a few alchemists emerged, most notably Armand Baubault in Europe and Frater Albertus in the United States. However, they remained reclusive figures, and only a few people took their claims of alchemical success with any seriousness. Given the almost complete disappearance of alchemy as a scientific possibility, one can still approach it as an important historical philosophy that has left behind a set of texts, symbolic art work, and many pieces of apparatus used by those alchemists who seem to have actually attempted the transformation of base metals. These relics of alchemy can be found in libraries and museums in Europe, and to a lesser extent in the United States. Albertus, Frater. The Alchemist of the Rocky Mountains. Salt Lake City, UT: Paracelsus Research Society, 1976. Barbault, Armand. Gold of a Thousand Mornings. London: Neville Spearman, 1975. Fernando, Diana. Alchemy: An Illustrated A to Z. New York: Sterling Publishing Co., 1998. Pritchard, Alan. Alchemy: A Bibliography of English-language Writings. London: Routledge & Kegan Paul, 1980. An alchemist researching the Philosopher’s Stone, a catalyst for transforming common metals into gold. Some medieval alchemists summoned demons to assist them in their discoveries. Others may have been contacted by extraterrestrials. The ancient demonic knowledge or alien science is passed on by certain secret societies today. The essence of medieval alchemy lay in the belief that certain incantations and rituals could persuade or command angelic beings to change base metals into precious ones. The seven principal angels whose favor the alchemist sought were Michael, who supposedly could transmute base metals into gold and dissolve any enmity directed toward the alchemist; Gabriel, who fashioned silver and foresaw the future; Samuel, who protected against physical harm; and Raphael, Sachiel, Ansel, and Cassiel, who could create various gems and guard the alchemist from attack by negative entities. Members of the clergy were skeptical that the alchemists were truly calling upon angels, rather than demons in disguise, and they recalled the words of the church father Tertullian (c. 160–240), who confirmed earlier beliefs that the “sons of God” referred to in Genesis were evil corrupters who bequeathed their wisdom to mortals with the sole intention of seducing them to mundane pleasures. Some students of the history of alchemy have stated that crumbling, yellowed records of the alchemists remain in dusty libraries—more than 100,000 ancient volumes written in a code that has never been sufficiently deciphered. Evidence disinterred from the alchemists’ libraries in Europe suggests that certain medieval and Renaissance practitioners conducted experiments with photography, radio transmission, phonography, and aerial flight, as well as the endless quest to transmute base metals into gold. If individuals of exceptional intellect, power, and wealth actually did achieve a high degree of technical accomplishment several centuries ago, perhaps alien life forms established an alliance with some of them as being worthy of receiving the benefits of extraterrestrial superscience. Perhaps we have early instances in which the mysterious Men in Black (MIB) visited a select number of Earth scientists. On December 27, 1666, when Johann Friedrich Schweitzer, called Helvetius, was working in his study at The Hague, a stranger attired all in black appeared and informed him that he would remove all Helvetius’ doubts about the existence of the legendary philosopher’s stone that could serve as the catalyst to change base metals into gold. The stranger immediately drew from his pocket a small ivory box containing three pieces of metal the color of brimstone and, for their size, extremely heavy. The man proclaimed that with those three bits of metal, he could make as much as twenty tons of gold. Helvetius examined the pieces of metal, taking opportunity of a moment’s distraction to scrape off a small portion with his thumbnail. Returning the metal to his mysterious visitor, he asked that he perform the process of transmutation before him. The stranger answered firmly that he was not allowed to do so. It was enough that he had verified the existence of the metal to Helvetius. It was his purpose only to offer encouragement to alchemical experiments. After the man’s departure, Helvetius procured a crucible and a portion of lead into which, when the metal was in a molten state, he threw the stolen grain he had secretly scraped from the stranger’s stone. The alchemist was disappointed when the grain evaporated and left the lead in its original state. Some weeks later, when he had almost forgotten the incident, Helvetius received another visit from the stranger. This time the man in black transmuted several ounces of lead into gold. Then he permitted Helvetius to repeat the process by himself, and the alchemist converted six ounces of lead into very pure gold. Later Helvetius demonstrated the power of the philosopher’s stone in the presence of the Duke of Orange and many other prestigious witnesses. After repeated demands for such incredible demonstrations, Helvetius exhausted the small supply of catalytic pieces that he had received from the mysterious visitor. Search as he might, he could not find the man in all of north Holland or learn his name—nor did the stranger ever again visit him. An increasing number of UFO investigators firmly believe that certain secret societies behind our terrestrial power structures have been communicating with alien intelligence and receiving guidance from them. Some theorists go so far as to declare that every major improvement in our culture, our science, our technology—literally every major turn humankind has taken throughout history—resulted from this behind-the-scenes alien manipulation. Principal among these secret societies, and the group most often named as the conduit for alien control of world governments, is the Illuminati, founded in 1776 by a German law professor named Adam Weishaupt. Persistent researchers claim to have traced the history of the Illuminati back to the ancient Temple of Wisdom in Cairo. Albertus Magnus (c. 1193–1280), bishop of Ratisbon, is said to have been another alchemist who achieved the transmutation of base metals into gold by means of the philosopher’s stone. Magnus is also credited with other extraordinary accomplishments, including the invention of the pistol and the cannon. In addition, he reportedly was able to exert control over atmospheric conditions, once even transforming a cold winter’s day into a pleasant summer’s afternoon so he and his guests could dine comfortably outside. Tradition has it that Magnus bequeathed the philosopher’s stone to his distinguished pupil Saint Thomas Aquinas; but once the devout Aquinas had it in his possession, he destroyed it, fearful that the accusations of Magnus’ having communed with Satan might be true. Many other alchemists, although never witnessing the legendary philosopher’s stone, achieved discoveries of lasting value to humanity. Ramon Llull (1235–1315) was credited with the discovery in about 1275 of ethoxythane (ether); Paracelsus (1493–1541) was the first to describe zinc and various chemical compounds in medicine; Blaise de Vigenère (1523–96) discovered benzoic acid. Discoveries increased during the Renaissance, when such men as Basil Valentine (fifteenth century) discovered sulphuric acid and Johann Friedrich Boetticher (1682–1719) became the first European to produce porcelain. If an ancient secret society of alchemists and alien superscientists developed a technology that they have managed to keep hidden from outsiders, the matter in perpetual debate is whether the Secret Ones are benevolently guiding us to a time when they can share their accomplishments more openly or are merely awaiting the appropriate moment to conquer the entire world. a unique cultural phenomenon especially widespread in Western Europe during the late Middle Ages. The word alchemy is derived from the Arabic al-chimia, which can be traced to the Greek chëmëia; it is related either to chéō, “I pour” or “cast,” which connects alchemy with the art of melting and pouring metals, or to Chēmía (Egypt), which connects alchemy with its place of origin. The major goal of the alchemists, dating from antiquity, was to transform (“transmute”) base metals into precious metals with the aid of an imaginary object—“the philosopher’s stone.” The period of alchemy, from the fourth to the 16th centuries, is characterized not only by the spread of speculative and “experimental” alchemy but by the simultaneous development of a practical craft-oriented chemistry. But it would be unjust to ascribe the entire increase of real chemical knowledge during this period to the latter; in each of the branches of alchemy it is possible to find beginnings of positive knowledge. It is apparent from the alchemy textbooks still in existence that alchemists had discovered or perfected the means for obtaining valuable mixtures and compounds—for instance, mineral and vegetable dyes and colors, glass, enamel, metallic alloys, acids, alkalies, salts, and medicinal preparations. They also created or improved methods of laboratory work, including distillation, sublimation, and filtration, and invented new laboratory apparatus, such as stoves for prolonged heating and stills. Sometimes, though very rarely, it appears that alchemists had anticipated later-discovered laws of chemistry. For example, in R. Bacon’s The Mirror of Alchemy there seems to be an unconscious approach to the law of constancy of composition. Speaking about the preparation of the “red elixir” from mercury and sulfur, Bacon writes: “. . . select a material containing pure . . . mercury mixed, uniformly according to a definite rule and in the necessary proportions with sulfur. . . .” The alchemists made speculative generalizations in natural philosophy as well—for example, the idea of the genesis of metals, founded on the material unity of the world and the theoretical possibility of reciprocal transformations of materials. Stated by Bacon, it can be traced, however, to the Arabs, who, in their turn, had modified Aristotle’s views on this question. Alchemy spread widely: there are strong Greco-Egyptian, Arabic, and Western European alchemic traditions. The achievements of the Chinese and Indian alchemists had no practical influence on the West. In Russia alchemy was not widespread. The most important successes of the Greco-Egyptian alchemists were obtaining metals from ore and preparing and processing metallic alloys (the Papyrus X of Leiden); the knowledge of chemical processes peculiar to various trades—for instance, distillation, means for assaying, purifying, and alloying metals, amalgamation, glassmaking, and dyeing—was deepened and broadened. Egyptian alchemists in particular were responsible for the discovery of sal ammoniac. Arabic-speaking alchemists—Geber, Avi-cenna, Abu Al-Razi and others—created the first real pharmacy, although their contribution to alchemy itself was not great. As the tenth-century Persian doctor Abu Mansur explains, the Arabs used organic materials, such as sugarcane and vegetable acids, in the preparation of medicines. Western economic, military, and political ties with the East played an important role in the spread of alchemy. In the period from the ninth to the 15th century European alchemy produced eminent thinkers who left their mark on the history of medieval culture. Among them were Ramón Lull (1235–1315), who wrote Testament Explaining in Two Volumes the General Chemical Art; Arnald de Villanova (1250–1313? ), About Poisons; Albertus Magnus (c. 1193–1280), About Metals and Minerals; Fra Bonaventura (1214–74), who established the fact that silver dissolves in nitric acid and gold in aqua regia; and Roger Bacon (c. 1214—c. 1292), The Power of Alchemy, The Mirror of Alchemy —one of the most prominent thinkers of the Middle Ages, who maintained that direct experience was the single criterion for true knowledge. Western alchemy in particular can be viewed as part of the medieval system of natural scientific knowledge. However, the numerous manuscripts of charlatans must be regarded critically, as must the scholastic manner of thinking peculiar to the Middle Ages and the language of alchemy and its ultimate results, which reflect the reign of magic and mysticism in science. Not until the 16th century, when iat-rochemistry originated, was the impossibility of “transmutation” of metals made clear by experimental methods and careful research; by the turn of the 19th century iat-rochemistry, combined with applied (technical) chemistry, led to the formation of chemistry as a science. For the science of that time the artificial creation of gold or silver was merely a practical problem. The initial theoretical premise of alchemy—the common nature of matter and its universal transmutability—can hardly be considered false. It would be incorrect to say that alchemy is only a rudimentary form of contemporary chemistry. In alchemy diverse manifestations of the creative activity of medieval man were indissolubly united. When alchemy employed experiments complicated by magic, it used the methodology of rational science even though these methods were not fully developed. When alchemy considered itself an art, a symbolic outlook predominated; thus the symbols drawn by the alchemists were not so much designations of concepts as allegories and images—for example, a reversible chemical reaction was sometimes symbolized by a dragon swallowing its own tail, the seven metals corresponded to the seven planets, mercury and sulfur to the maternal and paternal principles, and so on. Similarly, the obscurity of language in many of the alchemic tracts can be explained by the fact that they organically merge scientific and artistic representations of the world into an as yet undifferentiated form; the 14th-century alchemistic verses of G. Chaucer are an example. Besides this, alchemy’s philosophical and theological creativity contained both its pagan and Christian sources. It was precisely for this reason that Christianized alchemy (white magic) was legalized by Christian ideology and alchemy in its pre-Christian form (black magic) was regarded as unofficial and therefore a forbidden pursuit. This in many ways explains the tragic fate of several European alchemists, among them Roger Bacon and Alexander Setonius. European alchemy could unite theoretician and experimenter and practical craftsman, poet and artist, scholar and mystic, theologian and philosopher, and black magician and faithful Christian. Such a view presents alchemy as a phenomenon combining many aspects of medieval thought. Morozov, N. A. V Poiskakh filosofskogo kamn’a. St. Petersburg, 1909. Giua, M. Istoriya khimii. (Translated from Italian.) Moscow, 1966. Berthelot, M. Les origines de l’alchimie. Paris, 1885. Lippmann, E. O. Entstehung und Ausbreitung der Alchemie, vols. 1–3. Berlin-Weinheim, 1919–54. Stillman, J. M. The Story of Alchemy and Early Chemistry. New York, . Read, J. Through Alchemy to Chemistry. London, 1957. 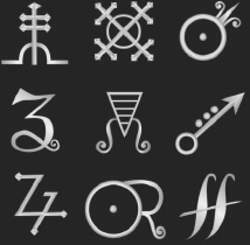 The use of symbols in alchemy has some parallels with dream symbols, noted Carl Jung. Alchemy is the ancient discipline from which the modern science of chemistry arose. The aspect of this discipline that is best remembered is the quest to discover how to transform ordinary substances into gold. Alchemy came to be related to dreams through the work of Carl Jung, who perceived archetypal images in the symbolic language of alchemy. Jung postulated the existence of an unconscious urge toward psychological growth and health that he termed the individuation process. This process propelled the individual toward psychic integration, bringing progressively more of the contents of the unconscious mind into the expanding awareness of the ego. Jung believed that the primary goal of alchemy—discovering the series of operations through which gold is produced—could be read symbolically as the individuation process. Jung noted four stages in the individuation process—stages that could be symbolized in dreams by the numbers one, two, three, and four. Dreams that seemed to stress duality, triplicity, or quaternity Jung interpreted as referring to these stages. The ancient alchemists associated certain colors with the stages, and Jung sometimes interpreted the predominance of black, white, yellow, and red in a dream as referring to one of the four stages of personal transformation. A speculative chemical system having as its central aims the transmutation of base metals to gold and the discovery of the philosopher's stone. Alchemy-ABR Investment Partners is the partnership of Alchemy Properties and ABR Partners, a New York-based real estate investment and development company led by Brian Ray. Ken Horn looking to grow Alchemy at 800 Third Ave. In The Secrets of Alchemy, he situates alchemy in its important role in human history and culture. We are delighted to be able to now offer the same support for the innovative Barco Alchemy product, giving exhibitors the freedom to make technology decisions that are not limited by compatibility with their existing systems. Founded in March of 2010, Alchemy is an email-based tool that extends the capacity of an organization. While we may have updated our brand, Alchemy's commitment to providing genuine, personalised service and our focus on servicing local and regional clients, remains central to our brand," said Heather Maytham, general manager of Alchemy. Mr Lacey said: "Our acquisition by Portland Financial Management Group represents an opportunity for Alchemy and its clients to benefit from additional expertise, advice and services from the wider group. Not only were they key moments in defining alchemy, primarily as an entrepreneurial practice, but they also contributed to the attacks on alchemy. This lively collection of 22 papers presented at the July 2006 conference in Philadelphia details the progress in research about how the arcane art of alchemy became the public science of chemistry in a remarkably short time, considering the incentives to remain arcane were powerful. To those not accustomed to examining the present in more than its immediate context it may, therefore, be shocking to realize that it was only toward the beginning of the eighteenth century that there emerged a marked tendency to sequester alchemy from the new science of chemistry and, although the divorce is now irredeemable, alchemy retains its own place in the annals of human thought. This is yet another example of our commitment to work with leaders in all fields," said Alchemy CEO Jonathan Read. Founded in 1999, Alchemy Enterprises, a publicly traded company headquartered in Scottsdale, Ariz.
Rather, the poems in Love's Alchemy are like a fine merlot, meant to be imbibed slowly--you begin by sniffing their aroma; then hold them up to the light and savor their color; inhale their bouquet; hold the words in your mouth, let the taste of them sink into your pores; feel them warming your throat, let their wisdom spread through your veins and into the depths of your heart.